I’m the very lucky owner of an industrial waffle-maker that I believe was once stolen from a waffle house, and many years and owners later, gifted to me. It’s gigantic, unwieldy and makes incredible waffles. Unfortunately, I always prefer savory breakfasts (and lunches, and dinners) and so I like to play with savory waffle recipes. My friends still talk about the cheddar habanero waffles I made one Easter (wowsa!). My super-handy and wonderful father was in town last weekend, and gave me some much-needed help with difficult home projects. Before he jumped in has car and headed away, I wanted to make him a special brunch, so I got out the waffle maker. It’s still pumpkin season to me, so I used the Bittman “How to Cook Everything” waffle recipe, pumpkin variation, which adds 1 cup of pumpkin puree to your recipe (and I ALWAYS whip the egg whites separately). To mix I also added the last of my fresh sage, chopped, about 6 Tbs. 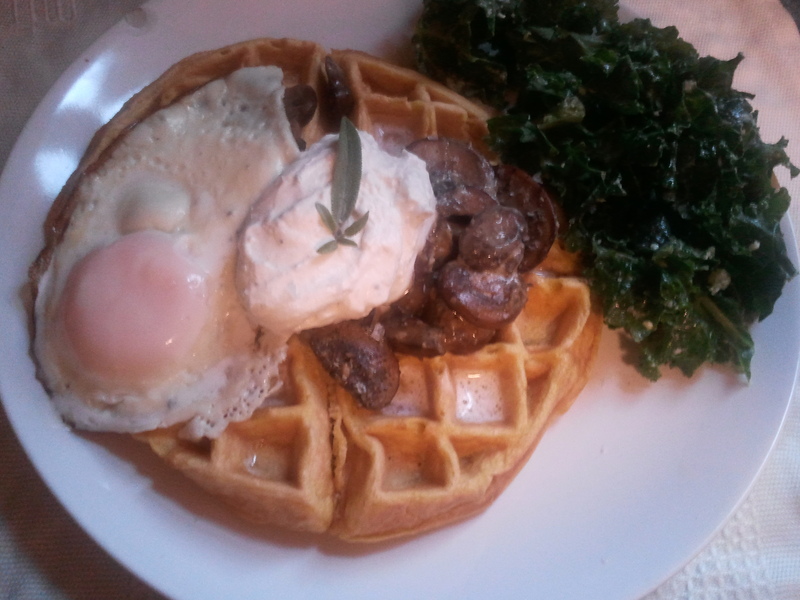 And what do you top a savory pumpkin sage waffle with? Of course, I buttered the waffle, too, and dad added maple syrup to his for a touch of sweetness. Feeling a bit guilty about richness of the meal, we had carrot-orange juice on the side, and my version of Jean-Georges Vongerichten’s kale salad from The Pump Room. While I can’t share all of the recipes with you, I can share the Blue Cheese Cream, because I made it up on a whim. Heat is a small saucepan, stirring often, until the blue cheese melts. Cool in a metal bowl in the freezer, until the cream mixture is COLD. Begin whipping with an electric mixer on the highest setting, slowly adding half-and-half until the cream reaches the consistency you desire (about 1/4 cup for the thick cream pictured above). The cream will begin to melt on contact with your hot waffler (or anything else). Delicious.